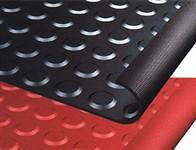 Rubber Dot Mat Model No. :FST0224 Size: 1.22Mx10Mx3-30MM 1mX (10-50)mX12mm 2mX (10-50)mX12mm Specific Gravity:1.5-1.7g/Cm3 Tensile strength:3.0MPA Hardness:70 SHORE A Elongation≥250% Performance: with middle pressure, good water proof, anti-slip performance Usage: The application of this..
Interlocking Rubber Mat Model No. : FST0220 Size: 914X914X12mm 915X915X12mm Weight: 6.5 kg Feature: 1) This item is anti-fatigue, oil-proof, and slip-resisting. 2) This item is well used in workshop, hotel, kitchen, hospital and so on. And it is very popular in USA, Australia, UK and some othe..
Rubber Mat Model No. :FST0223 Dimension: 2420X910X7mm 2420*910*9mm Weight: 28kg 20' Container: 720 pieces Use: Widely applicable to worktable floor, construction site, shop, walkway and doorway. Rubber Mat Model No. :FST0222 Dimension: 1524*914*12mm Weight: 8.5 kg 20-foot Container: 1600 pieces Use: The product is widely used in commercial kitchen and industrial sites to improve drainage, which can keep clean and dry. Rubber Mat Model No. : FST0221 Dimension: 1524*914*19mm Weight: 15.5 kg 20' Container: 1,000 pieces Feature: 1) This item is anti-fatigue, oil-proof, and slip-resisting. 2) This item is well used in workshop, hotel, kitchen, hospital and so on. And it is very popular in USA, Australia, UK and ..